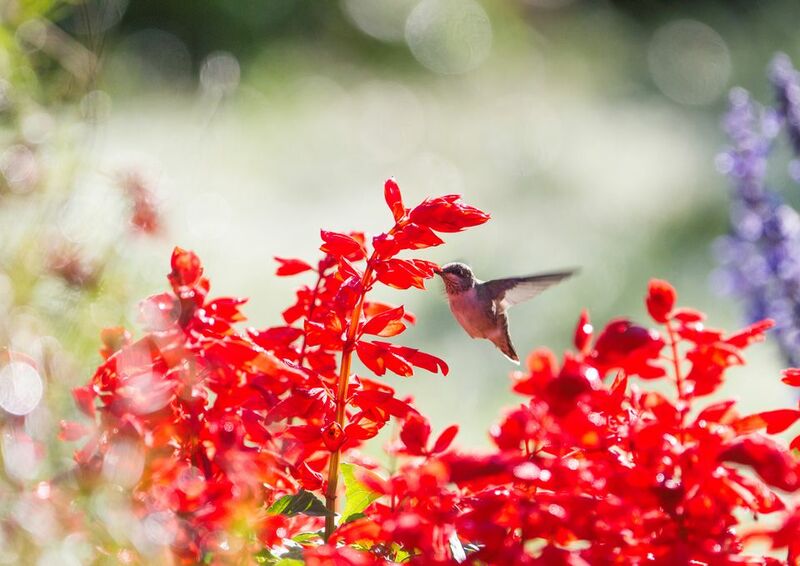 Seeing a hummingbird darting through your garden is as delightful as seeing your flowers burst into bloom. To attract hummingbirds and keep them coming back to your garden regularly, make sure to include a few hummingbird plants in your design. What makes a plant a hummingbird favorite? It needs to be nectar-rich and preferably tubular in shape, which encourages the tiny birds to feed. On the following pages are 10 hummingbird plants that fit the bill. Note that some are great for containers or hanging baskets. There are many varieties of Agastache, and all of them are high in nectar. Agastache rupestris, shown here, is part of a group sometimes called the hummingbird mints. These flowers are also butterfly magnets. More border plants that are open invitations to hummingbirds are bee balm (Monarda hybrids), which also lives up to its name and attracts bees by the hiveful; and those towers of flowers, delphinium, hollyhocks, and foxgloves. Cardinal Flowers are a great choice for adding drama to a shady corner. Hummingbirds can spot their vivid red flowers no matter where you tuck them. And they are native plants in many areas. Another native plant choice, also great for partial shade, is red columbine. Red columbine is so sweet, children often compete with hummingbirds, pulling the flowers apart for that precious drop of nectar. Who would have thought the delicate flowers of coral bells would be large enough to attract hummingbirds? Coral bells are a favorite of hummingbirds, but they only bloom once a season, and many gardeners cut them off in order to divert energy into the plant's leaves. If you want hummers to visit you, let the plants bloom. There are many great perennials that will keep your hummingbirds happy. Choose a hosta with beautiful flowers, like the sweet-smelling Hosta plantaginea. Or try one of those long bloomers, lupine, larkspur, and liatris. Four o'clocks do not open until late in the afternoon, but they are worth waiting for. Their tubular flowers are perfectly shaped for visiting hummingbirds. If you'd like to get an earlier start, morning glories (Ipomoea tricolor) open with the sun and remain open until the afternoon heat. They also re-seed readily on their own, so although they are annuals, you often only need to plant them once. There are more than 100 species of fuchsia. Most of them are tropical or semi-tropical and are grown in many areas as annuals. The trailing varieties are perfect for hanging baskets and can attract a wide variety of visitors, wherever you hang them. This plant works welling in containers or hanging baskets. Lantana is a plant recommended for novice gardeners. It is a striking plant, and if you are lucky enough to be growing it in USDA zone 8 or higher, you can grow it into a shrub or even a standard the size of a small tree. The rest of us can still enjoy it as an annual. It's also nice in containers. For those in cooler climates, try rose of Sharon (Hibiscus syriacus), also a woody shrub capable of being trained into a small tree and covered in flowers for weeks on end. Who hasn't grown petunias? They're a garden staple. The flowers are also the perfect shape for a hummingbird dinner. Some of the newer varieties are not particularly fragrant and may not have as much nectar as the older open-pollinated varieties, but give them a try. Petunias are natural creepers and often used in hanging baskets. If you'd like a longer vine for trailing or climbing, some good choices include canary creeper (Tropaeolum peregrinum), cardinal vine/ cypress vine (Ipomoea sloteri) and the quick growing scarlet runner bean. New salvia varieties are constantly being introduced, and they are wonderful for attracting hummingbirds and butterflies to your gardens. Whether the blues of mealy cup sage (Salvia farinacea), 'Black and Blue' anise sage (Salvia guaranitica), or scarlet lady in red, these hummingbird plants will bloom virtually non-stop throughout the season. Although gardeners might take impatiens for granted, hummingbirds see them for the treat they are. Another annual hummingbird plants that have been in gardens for generations is flowering tobacco or nicotiana. Snapdragon flowers only snap shut on children's fingers—a fact that generally delights them. Hummingbirds can navigate them with ease. Snapdragons are cool-season bloomers, attracting the first hummers to visit your garden and making an encore at the end of the season. Bleeding heart (Dicentra species) are equally charming to both gardener and hummingbird and, like snapdragons, they prefer cool spring weather. Weigela is making a big comeback after being written off as a stuffy old shrub. New varieties have colorful and/or cut leaf foliage, giving them a long season of interest. Most also have flowers with the tubular shape favored by hummingbirds.